'Nearacre', the Edmund Burton Lyon estate designed by Dwight James Baum c. 1917 in Hempstead. Lyon's son Cecil Burton Lyon was Ambassador to Chile and Sri Lanka. The home appears to have since been demolished. 1) Scuff marks at the threshold; why touch up the paint for a magazine photograph? 2) Rugs fitting snugly as a jig-saw puzzle; although I'd guess no one walked around barefooted. 3) Is that a radiator to the left in the photograph of the stairs? What a find Zach!! These Hempstead/East Meadow/Salisbury estates are such an enigma to me....so little is known of them and even less photographic evidence of them exist. Yup, that's a radiator pipe all right ! 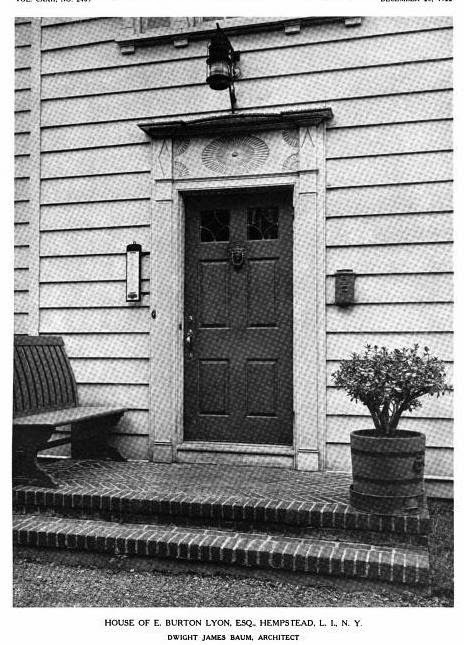 My attention was attracted to the front entrance door - a temperature gage to the left, as well as the doorbell. Could that be a call-box to the right ? 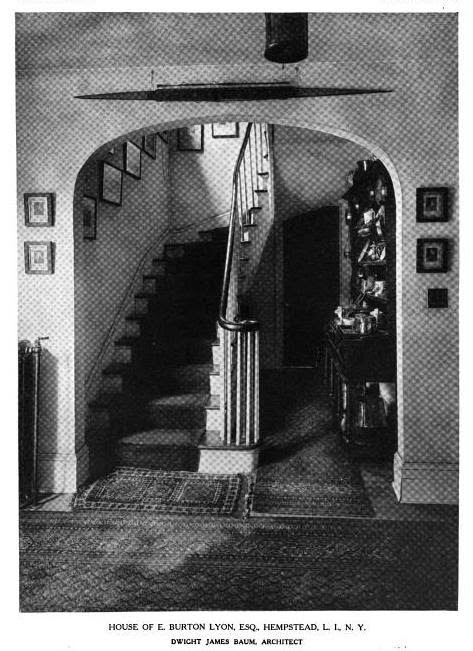 And what could possibly be that object displayed over the stair alcove arch ? My guess is the object over the arch is a model of a six or eight-person rowing shell (boat). Seems odd [to me] to have a radiator conspicuous in the hall of a LI country house built c.1917. Surprisingly "American" compared to his more well known, exuberantly detailed, works such as Ringling Sarasota, 63rd Street YMCA in NYC, Murray on Red Ground Road and all of the Riverdale houses. Perhaps it was a Bottomley style remodel? In any event, I like it. 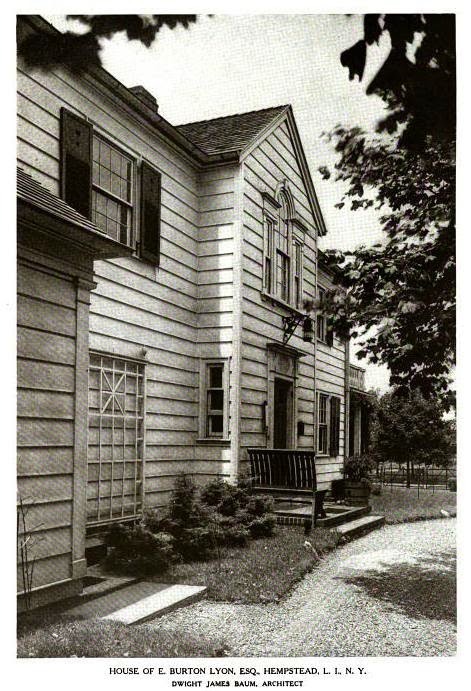 Is there any information on the Tudor style country house in Eisenhower/Salisbury Park? I've always been curious about that house also.